I have been going on and on about how I am digging iron signals and finding stuff that is not iron. 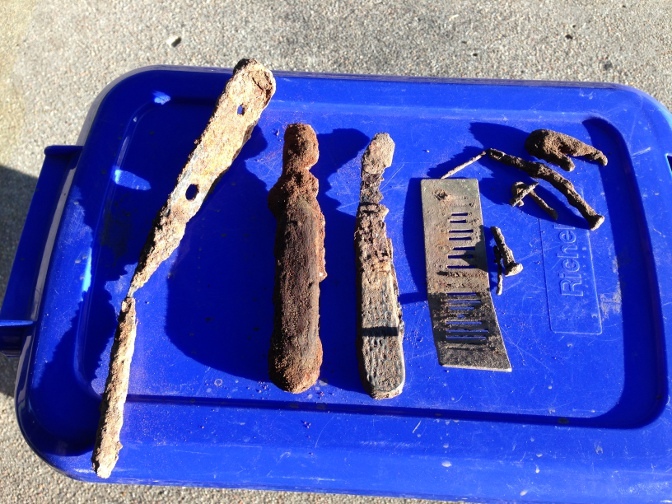 I was digging around an old park yesterday at lunch happily unearthing rusted nails when it dawned on me that I have not been 100% accurate while describing what it is I am doing. To be precise, I am not hunting iron signals but wrap-around signals. To understand what a wrap-around signal is, picture your VDI scale from 00 to 99; 00 being iron and 99 being a nice shining silver dollar. That’s what the real VDI scale should look like. Wrap around happens when the sweet signal from the high 90’s –97,98,99, bleeds into the low iron readings, 00, 01, etc. I don’t pretend to understand why this happens but it is common to all detectors. Now, when I am hunting iron, I am not digging the low grunts. Those may be good targets but I bet that when the Deus generates a low grunt, it is accurately identifying iron. I set my Deus with a very low iron discrimination. 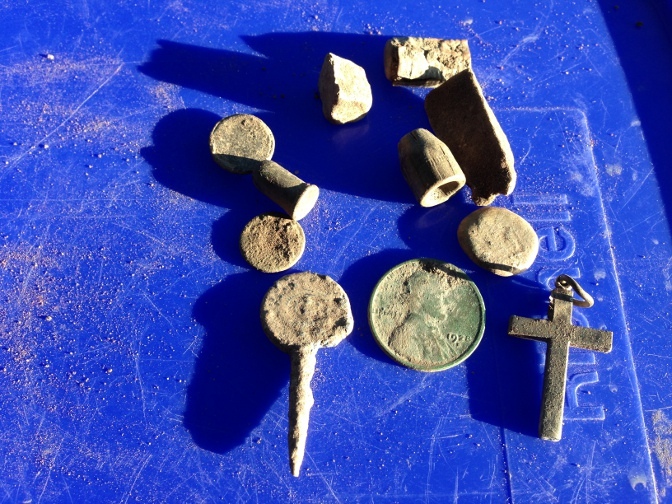 What I am digging are those wrap-around signals and so far my method is somewhat good as I dig many items that are not iron with those high tone wrap around signals. One thing I would like to share is the broken nature of a rusted nail signal. Often, the wrap-around signal generated by a rusted nail is broken, kind of like static. Non-iron wrap-arounds are often solid beeps. The other thing about the wrap-arounds is that if I really pay attention, coins that fall in this category of signal still have that sweet audio signal albeit harder to discern. It takes practice; lots of practice. That is the reason why I still gleefully dig rusted iron. It’s all about educating the ear. So there. Now you know what I am doing. Do you want to discriminate iron? Or do you want to identify it? There is a subtle difference here. To be sure, your detector has to identify iron before it can discriminate it. I believe the term discriminate comes to us from the time when detectors only had one tone and had no visual identification system. Basically, the machine would beep and then you would adjust a discrimination knob until the beep stopped. This was how you could tell if the beep was iron or if it was something else. Nowadays, with the digital displays and with the multiple tones to help us id the targets under the ground,I think it’s important to know when the detector has identified iron. Knowing if your ground is laden with iron is very useful. Also in some machines anyway, if you discriminate iron, you may miss good targets sitting next to the iron. In other words, let the machine tell you when iron is present. I run my machines wide open and I let the detector tell me when the iron is there. It’s all about getting more information about what’s under your feet. Does it make a difference? I think so. Thank your for looking and Happy Hunting!